This beautiful edition of the children’s classic Pippi Longstocking is illustrated throughout with wonderful collage pictures from the award-winning Lauren Child. The contemporary design, imaginative layout of the text, and stunning illustrations from Lauren Child all add up to a perfect gift purchase. Pippi lives in Villa Villekulla with a horse, a monkey, and a big suitcase full of gold coins. 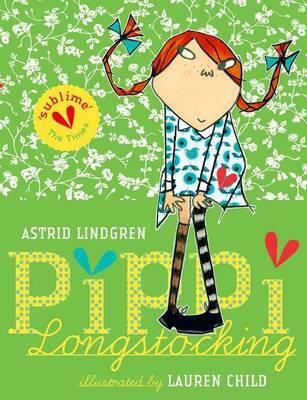 The grown-ups in her village try to make Pippi behave in ways that they think a little girl should, but Pippi has other ideas. She would much rather spend her days arranging wild, exciting adventures to enjoy with her neighbours, Tommy and Annika, or entertaining everyone she meets with her outrageous stories. Pippi thinks nothing of wrestling a circus strongman, dancing a polka with burglars, or tugging a bull’s tail and her wildly unconventional lifestyle is matched by Lauren’s free-spirited illustrations. When I was choosing a book to read as a kid, I cared not a jot about the gender of the protagonist, or what the cover looked like. I didn’t even notice books were categorised into genres until my teens. All I ever required of a book was that the child had no parents. It sounds morbid, I know, but who can honestly tell me it’s possible to go on marvellous adventures with your mum telling you to go to bed, or to quit rolling biscuit dough on the kitchen floor? I was ever so envious of Pippi Longstocking. She lives alone in a big house with a horse and a monkey; she doesn’t have to go to school and she’s full of fantastical stories about shipwrecks and a man with ears so big he could crawl under them in the rain! She is as much a hero to adult-me as she was to child-me. Dani Solomon works in the Children’s & YA section at Carlton.